Kitchens are prone to wet floors. This creates a safety hazard for anyone visiting the kitchen and anyone working there. 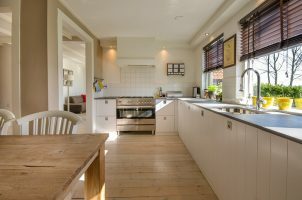 Why is the kitchen floor so likely to become damp? There are many reasons, including spills, splashes from the sink, post-mopping glaze and more. Homeowners want their kitchen floors to remain as dry as possible, with children and pets running through, company coming over to visit, and simply avoiding the aggravation of damp socks. How can you dry your damp kitchen floor to avoid those wet socks and messy footprints? There are several methods you might consider. You can try air drying — keeping people and animals clear of the wet floor until it’s dry. Or can you try towel drying when needed, though this is an inconvenience as it can be physically taxing, and also results in a damp towel that may mildew if not dried soon after use. Another option is a floor drying fan that is intended to quickly and quietly dry your damp kitchen floor. You can choose any one of a number of methods for keeping your kitchen floor dry, and each offers its own pros and cons. With air drying, you don’t need to buy any additional tools or materials to dry your floors. But air drying is easily the most time-consuming method for getting rid of kitchen floor dampness, and life doesn’t always allow you the time and space needed to wait that long. Inevitably you’ll need to venture into the kitchen for some reason, and the bottoms or your feet or socks are sure to get wet. Towel drying is another common solution, and it’s one that delivers a dry floor much faster than simply air drying. What makes towel drying inconvenient is that you have to do it yourself, and you have to make sure that you cover every square inch of the flooring, which can be difficult, especially if you’re working around furniture. If you use paper towels, you go through them quickly. If you use cotton or cloth towels, you develop a pile of wet laundry to do. Neither is an attractive scenario. If you have a ceiling fan in your kitchen, you can use it to accelerate the drying process. This is faster than air drying, and leaves no pile of wet towels to deal with. However, a ceiling fan creates circulation without directing the airflow. It will not help you reach under counters and tables, and it can blow around things such as papers or hand towels, especially when the fan is set to a high speed. You can also choose to invest in a box fan or axial fan, which provides a more direct flow of air than a ceiling fan. But these types of fans fail to concentrate their air flow, and they can also be incredibly noisy. Finally, you can choose a centrifugal air mover like the B-Air® VP-25. This type of air mover delivers high pressure and concentrated air flow. It features three different speeds, so you can choose what works best for your needs. Best of all, it delivers fast drying power without the noise and inconveniences of the other options. The B-Air® VP-25 is also stackable for easy storage. When you need a floor drying fan for kitchens, choose the B-Air® VP-25, which is both compact and powerful. It is just the right size for drying small spaces and it runs on just 2.1 amps while operating quietly. As with all B-Air® equipment, our VP-25 models are high-quality and durable in design and performance. Make sure you’re getting the best among kitchen floor drying fans when you choose the B-Air® VP-25. Questions? Contact one of our experts!